The doctrine of Mental informs us to mine our minds for the jewels of the soul. This is one of the many great wisdoms of Hah Kha that teaches us the wisdom that All is mental and that each individual has a mind. Essentially, this wisdom runs parallel with ancient western teaching that all things have spirit (manito). Learning about oneself is not only subjective (personal), but also learning about spirit outside subjective thinking is impersonal and yet every individual mind is fed from the same mental reservoir, which empowers each individual to readily grasp or comprehend the laws of the mental universe and to apply such laws the same to his or her ecology, wellbeing, and advancement while on the path of life (Pa Taraq). Free flowing water is important for the balance of life. To restrict the flow of the waters (nabah, Nuwaubu) is to kill the life that depends on it for sustenance. We learn that the word Nuwaubu is connected to the Aramaic-Hebrew word Mabuwah (fountain/spring/well), which comes from the primitive root Nabah (to gush forth, to flow). In Olmec-Maya hieroglyphs, the glyph for water-lily and water can be interpreted as either naab or ha. Together, the terms naab and ha renders naabha or in Aramaic-Hebrew as nabah. These terms signify conduits of spirit, which is depicted in the metu neteru as the blue lotus/water-lily. We learn that the creator god, Atum-Re, had emerged from the blue lotus. Metaphorically, the primitive root Nabah is connected with water flow (i.e., streams, fountains, springs, and rivers). The Moon controls the tides, whereas the Sun controls the winds on planet earth. As you know, the three basic phases of water are solid, liquid, and vapor. The fourth phase of water is the Sun itself whose life comes from the fusion of hydrogen, which means to produce water, into Helium (Set or Khet), which means light or fire. The fifth phase of water is the solar winds that interact with the several atmospheres (minds) of the earth as speech or commands (Hu) for its ecosystem. Water in its liquid state exerts orthogonal pressures or forces in earth’s environment. Moreover, water in its liquid state is capable of flowing (nabah) and thus fields of energy or activity (electric and magnetic) are produced. However, water in its solid state exerts only a horizontal force on earth and is more so subject to the laws of gravity (logic) than any of the other phases. One must thus learn how to invert the containment process and blossom from the blue lotus as Atum-Re, who carried out the operative processes (nabah) in accordance with Ma’at. The mental dead must blossom and this requires Right Knowledge and actual facts in the context of Nuwaubu, known in Tama-Re of the East as wu bu nu (i.e., to rise in radiance) and Tama-re of the West as Wu Nuwaubu (Sound Right Reason, Law of Great Peace). The word NUWAUBU has a value of 103, which is the molecular structure of water (103 degrees) and the spiral growth of water lilies in nature, when degrees are translated into minutes of arc (6180 minutes of arc). 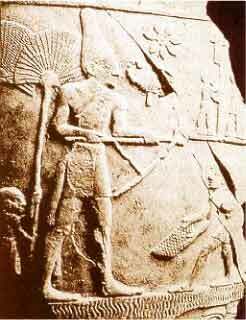 Water in its vapor state exerts forces uniformly in all directions (ma’at). Nuwaubu has taken us through many phases in the last age. We have left the age or state of Pisces (liquid, Mu) and have entered into the age or state of Aquarius (vapor, Nefu). In this new age, NUWAUPU is metaphorically Energy, which is equated to the value 117. This value has a product of 13 x 9, which is symbolically MC^2 i.e. the acceleration of mass relative to the velocity of light, which demonstrates that light or radiant energy (momentum) has an equivalent mass. Mass and energy are different manifestations of the same thing. Energy means to be operative i.e. to have movement (momentum), to be active, vigorous activity (Nabah = to flow), et cetera. The time to center ourselves has come and to approach an eccentricity of zero, which is the geometry of the circle (Ra). This unity is demonstrated in the Barbury tetrahedron formed in 1991. Each of the three circular formations at the vertex of the tetrahedron represents the star hexagon (Judaism), crescent moon (Islam), and ankh (Christianity). They coincide at the apex of the tetrahedron to create the ancient scientific ensign for Nuwaupu (9 x 13) at 19.5 degrees north and south lattitudes. Last edited by Pa Neter Ra; at 11:23 PM..